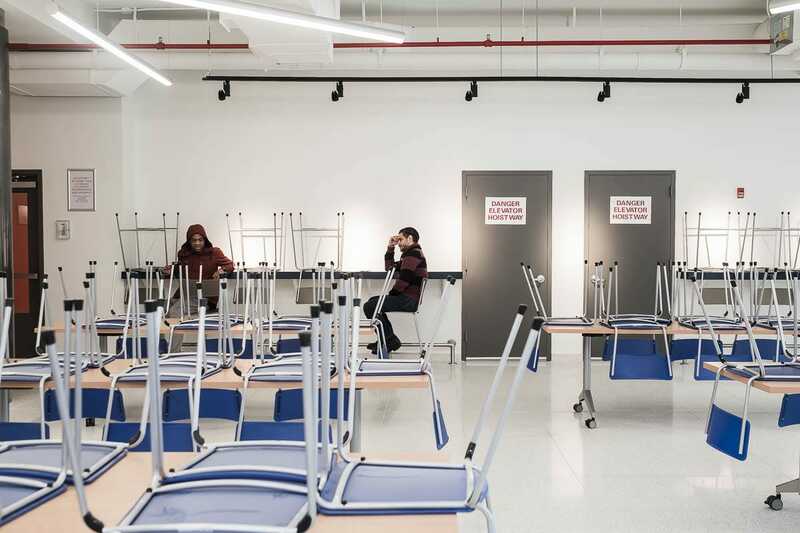 Harrison Jacobs/Business InsiderNew York thinks the answer to its homeless crisis lies at a new kind of shelter. Experts aren’t so sure. New York City has the largest homeless population in the United States with 77,000 homeless people. 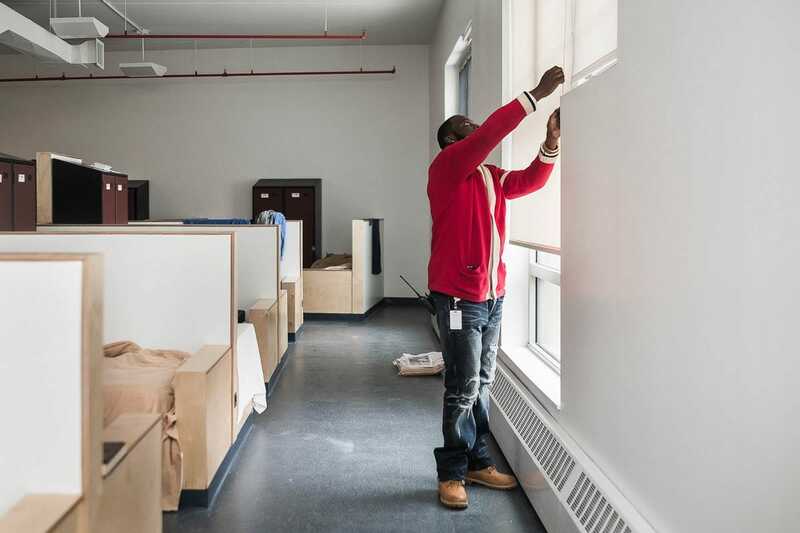 The De Blasio administration is tackling the issue by closing hundreds of low-quality shelter sites and building 90 new ones, including an innovative Bronx facility that combines a 200-bed shelter with more than 100 units of affordable housing. Experts say that the newly-opened building, and other shelters like it, may be “a step in the right direction,” but the money may have been better spent directly on affordable housing. With around 77,000 homeless people, New York City has the largest homeless population in the country. And while that constitutes a crisis, most who work on the issue say homelessness is really two problems: a lack of quality homeless shelters and a lack of affordable housing. Those two issues feed the larger vicious cycle of homelessness, where many people become homeless because they can’t find an affordable home and then stay homeless due to shelters that don’t deliver adequate services to get people back on their feet. Muzzy Rosenblatt, the CEO of nonprofit shelter provider Bowery Residents’ Committee, and Steven Banks, New York’s commissioner of social services and the man tasked with alleviating the crisis, think they have a solution. Or at least a start. 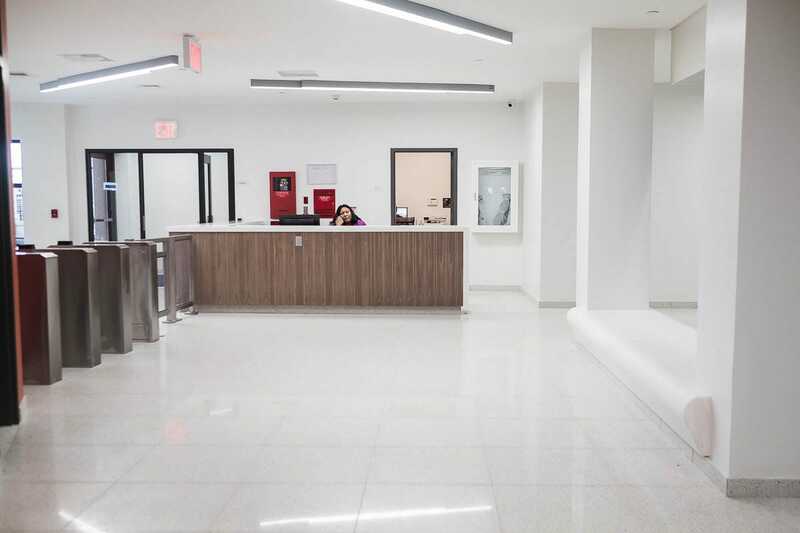 In February, BRC and the City opened the Landing Road Residence, a $US62.8 million facility in the Bronx that uses a 200-bed homeless shelter to subsidise 135 low-income apartments. Landing Road is able to do that because BRC developed, owns, and operates the building. 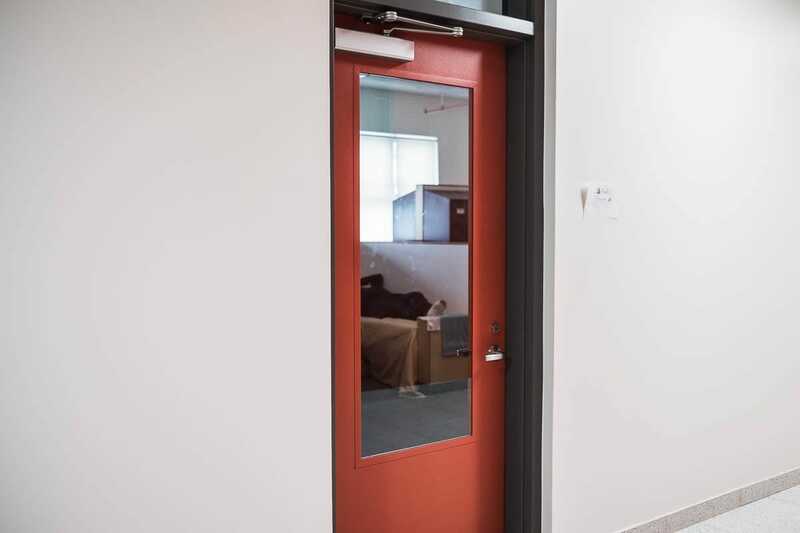 Most other shelters are housed in buildings owned by private developers who rent the space at market rates to nonprofits, who ask the city to reimburse its costs. Rosenblatt told Business Insider that several years ago he had an epiphany: why not own the actual building, take out the income that a landlord would have kept as profit and use it to subsidise permanent housing. “[This model] takes the cycle and makes it virtuous,” said Rosenblatt, who contends that by creating permanent housing, the demand for shelter shrinks, which allows the city to spend less on emergency housing and avoid spending on low-quality shelters simply to meet demand. Rosenblatt and the De Blasio administration are hoping that Landing Road becomes the city’s model for shelters, as the administration seeks to revamp the shelter system by closing more than 360 sites and building 90 new facilities as part of its Turning The Tide program. But some experts have questioned the efficacy of funelling hundreds of millions of dollars into building new shelters, even those like Landing Road, when the federal government’s Department of Housing and Urban Development and a vast cross-section of researchers say the best solution to homelessness is skipping shelters altogether and placing homeless people directly in affordable housing and providing support services, a strategy known as Housing First. 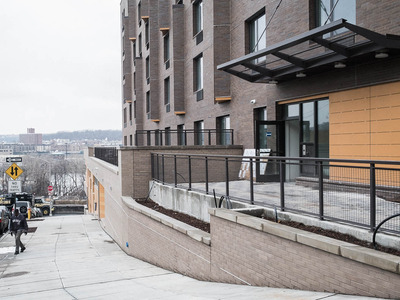 Landing Road is the city’s newest homeless shelter, located on a cul-de-sac overlooking the Major Deegan expressway in the Bronx. The bottom two floors are a 200-bed shelter for single men. The rest of the building is affordable apartments ranging from $US470 to $US1000 a month. Harrison Jacobs/Business InsiderThe front entrance to Landing Road residence. 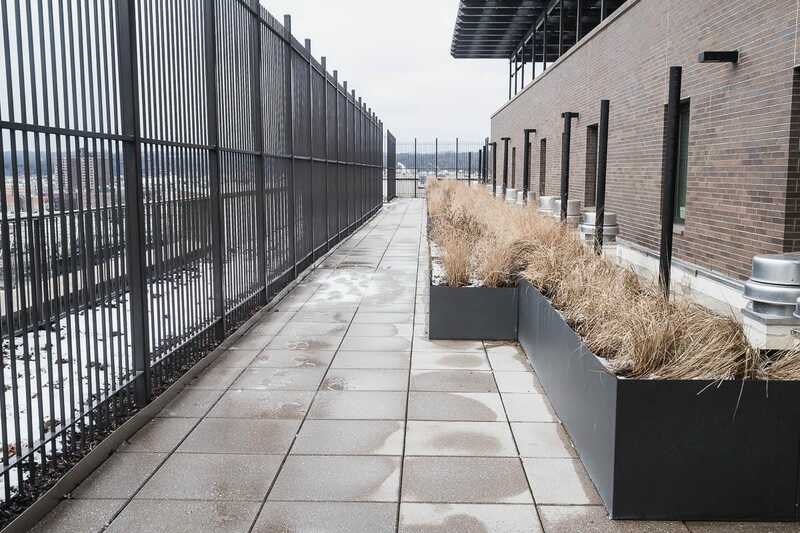 The facility’s model is based on the commonly accepted idea that the city’s homelessness issue is tied to a lack of affordable housing. 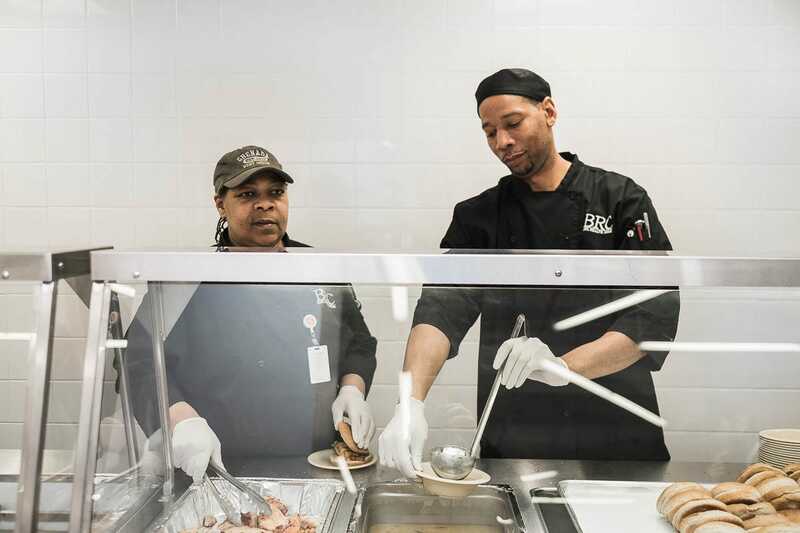 “The new face of homelessness,” Banks told Business Insider, is working people who fall into the shelter system because their income can’t cover their rent. 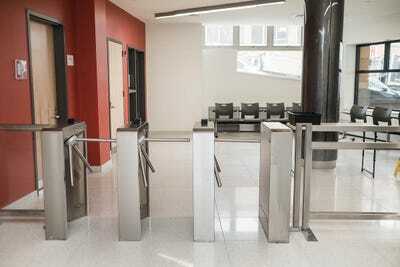 Harrison Jacobs/Business InsiderThe entrance gate for Landing Road Residence. The facility has a curfew of 10 p.m. on weekdays and 11 p.m. on weekends. Since 1994, homelessness has exploded by over 100% in New York, while rents have gone up around 19% in real dollars, household income has actually gone down 6.3%, and the city has lost hundreds of thousands of rent-stabilised apartments. 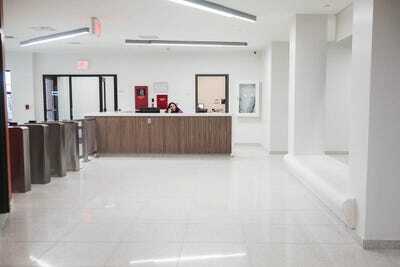 Harrison Jacobs/Business InsiderThe entrance lobby of Landing Road Residence. Staff members are on site at all times. Last year, the De Blasio administration launched its Turning The Tide program, a multi-pronged effort to stem the homelessness issue by revamping the shelter system with 90 new shelters, as well as an affordable housing plan that calls for building or preserving 300,000 units of affordable housing by 2022. Harrison Jacobs/Business InsiderA hallway in Landing Road Residence. The plan also calls for adding 15,000 units of housing with support services for those with mental health, substance abuse, and other issues. 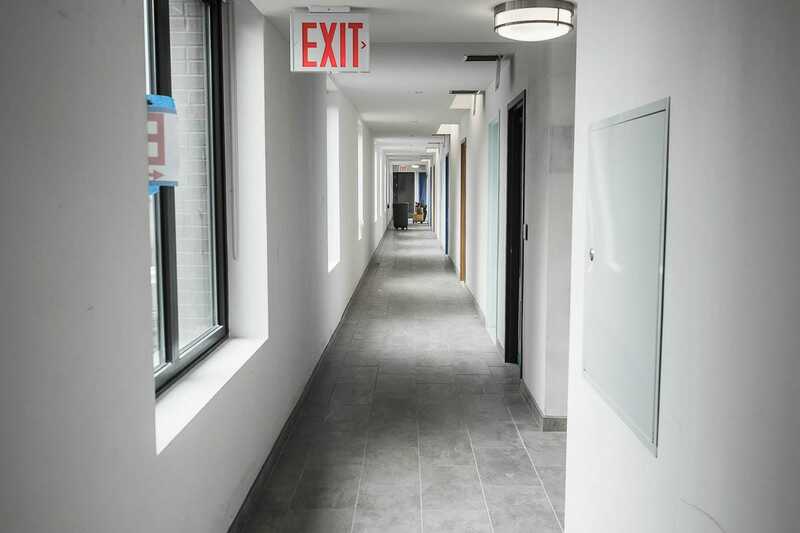 The De Blasio administration announced earlier this week that the number of people living in city shelters stayed flat last year, which it sees as a victory for the plan. The plan also launched rental assistance and rehousing programs like Living in Communities (LINC), which helps people move out of shelters. But Banks said those efforts have taken time to develop because the administration has had to rebuild the programs from scratch after similar programs were discontinued under Bloomberg. 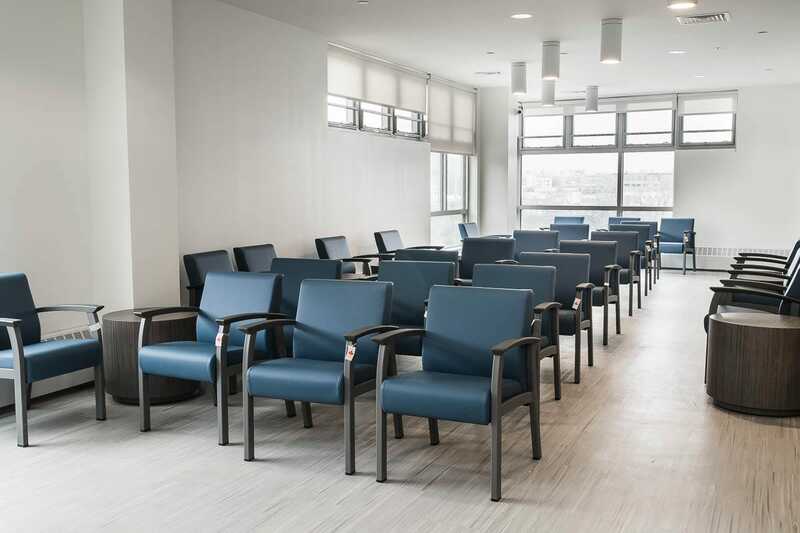 Harrison Jacobs/Business InsiderA gathering space for clients to hang out at Landing Road Residence. The most visible result of the Turning The Tide program so far has been the revamping of the shelter system. 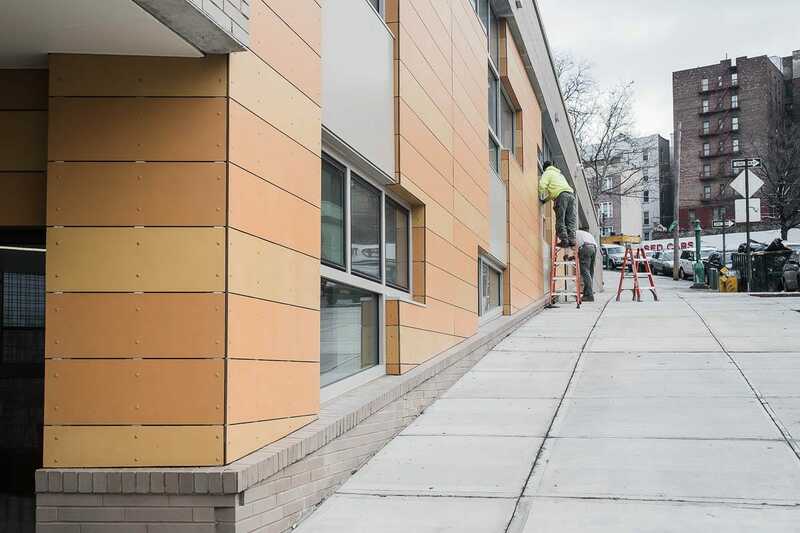 In the last year, the city has opened 11 new shelters, Landing Road being one of them, with another six set to open by June. 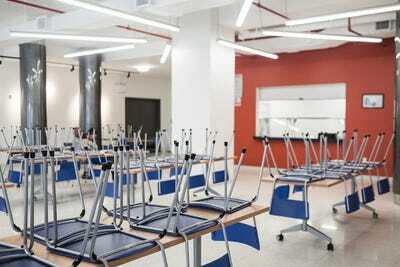 Harrison Jacobs/Business InsiderThe cafeteria at Landing Road Residence. Unlike many other shelters, the facility has a kitchen on-site. 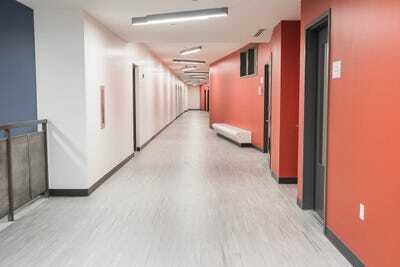 Some experts, like Padgett, the NYU professor, have criticised the city’s focus on the shelter system, saying that it is costly and outdated. The Department of Housing and Urban Development said in December that it is more “efficient and effective” to put funding directly towards housing and support services for the homeless, a strategy known as Housing First. Harrison Jacobs/Business InsiderAn event space that will be used for Alcoholics Anonymous meetings, job training, and other events for clients. A number of research studies have found Housing First to be more effective for alleviating homelessness for families experiencing temporary homelessness, for those suffering chronic homelessness, and even those with substance and mental health issues. “The whole country is moving in that direction,” Dennis Culhane, a professor at the University of Pennsylvania and a leading researcher on homelessness, told Business Insider. Rosenblatt said that because New York is mandated to provide shelter to anyone homeless, there is a lot of pressure on the system. It’s hard to divert shelter funds to housing when the city is just trying to stay above water on the shelter population. 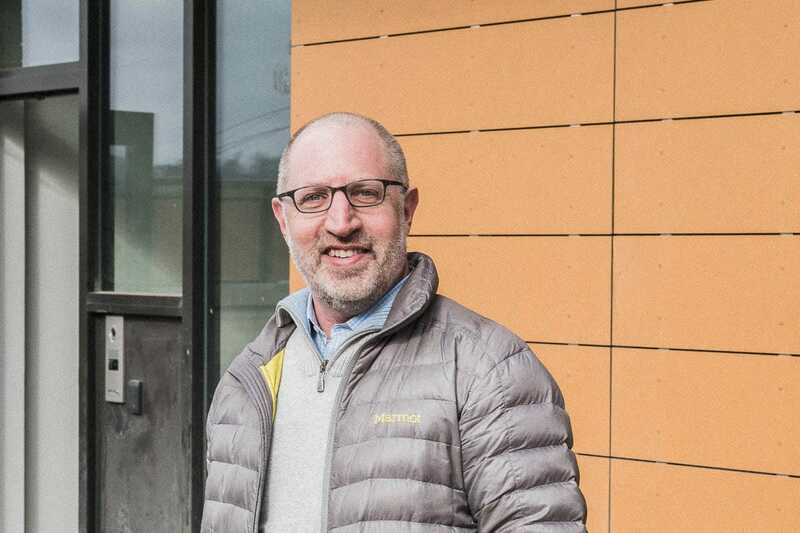 Rosenblatt said that he hopes that Landing Road and other facilities like it will eventually take pressure off the shelter system, giving the city the space to shrink the shelter system, get rid of poorly performing shelters, and focus on quality providers. 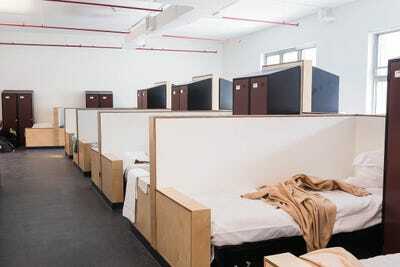 Currently, New York has around 60,000 people in homeless shelters around the city. In Rosenblatt’s view, if you could take even a third of the shelter system and convert it to Landing Road-esque facilities, you could generate enough subsidies to support 10,000 permanent low-income units without changing how the city spends its funds. Harrison Jacobs/Business InsiderThe Landing Road Residence provides social services on-site for its clients. But making that kind of impact on “throughput” (i.e. moving more people from shelters to permanent housing) is contingent on nonprofits following the Landing Road model, which is no simple task. Harrison Jacobs/Business InsiderA staff member at the Landing Road Residence tidies up one of the dorm rooms. Creating a facility like Landing Road requires a lot of upfront capital, which most nonprofits don’t have. BRC was able to build Landing Road due to a stroke of good luck, according to Rosenblatt. Several years ago, a developer bought out the nonprofit from a 25-year commercial lease on Manhattan’s Lower East Side that provided enough funds for a down payment on the Landing Road property and the costly pre-development activities like zoning analysis and design that are the primary barriers to developing new projects. But that was more or less a one time deal. BRC is now raising money, using Landing Road as a proof-of-concept, to open two more similar facilities. Rosenblatt said BRC has secured $US2 million in funds out of a goal of $US7 million. Harrison Jacobs/Business InsiderThe entrance to a dorm room on the first floor of the Landing Road Residence. 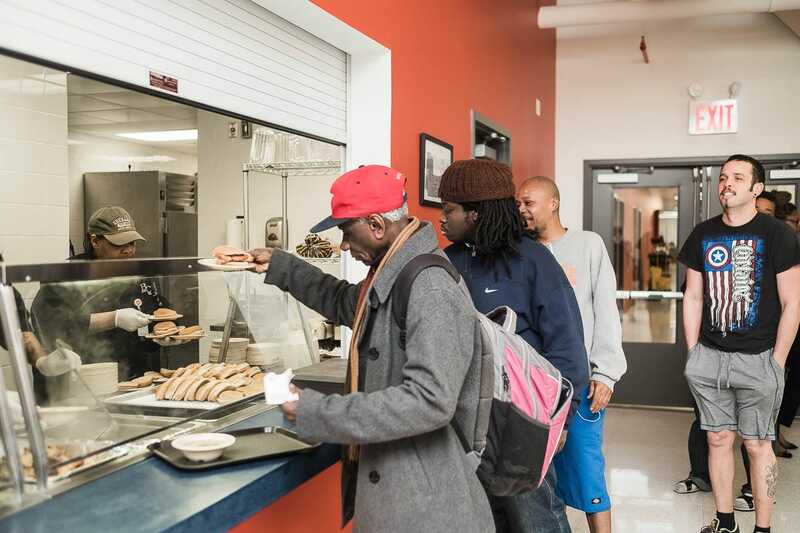 Landing Road is one of BRC’s “employment shelters,” meaning it focuses on single adults without severe mental health disorders or substance abuse issues who are able to work, are in job training, or are searching for work with BRC’s help. Most are likely at the facility due to job loss or difficulty finding housing they can afford. Harrison Jacobs/Business InsiderA sleeping area in a dorm room of the Landing Road Residence. Other shelters in the system focus on high-needs individuals who may just be coming off the street or suffering from severe disorders. Harrison Jacobs/Business InsiderRod Benedeo, the director of the Landing Road Residence. 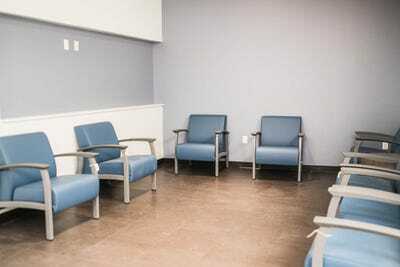 Those shelters, often called Safe Havens, have few rules around hygiene, curfew, or sobriety in order to use the shelter. Landing Road meanwhile has strict rules on those points, like the requirement that clients not stay in the dorms after a certain hour of the morning. According to Padgett, if any shelter provider is going to experiment with a model like this, BRC has one of the best track records in the city. While the average stay for a single adult at a shelter is around 335 days, for BRC’s “employment shelters,” it is only 220 days. 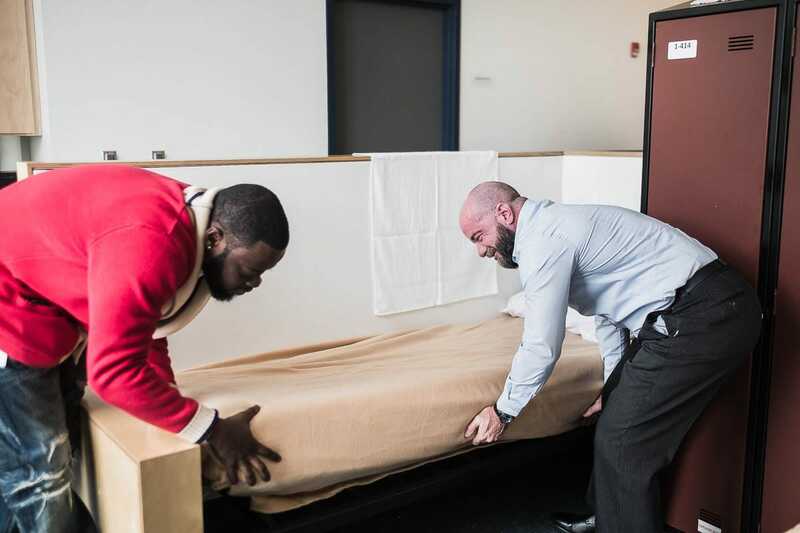 Harrison Jacobs/Business InsiderBenedeo and a staff member make a bed in the dorm room of the Landing Road Residence. Each client gets 60 square-feet of space and beds are required to be separated by three feet. 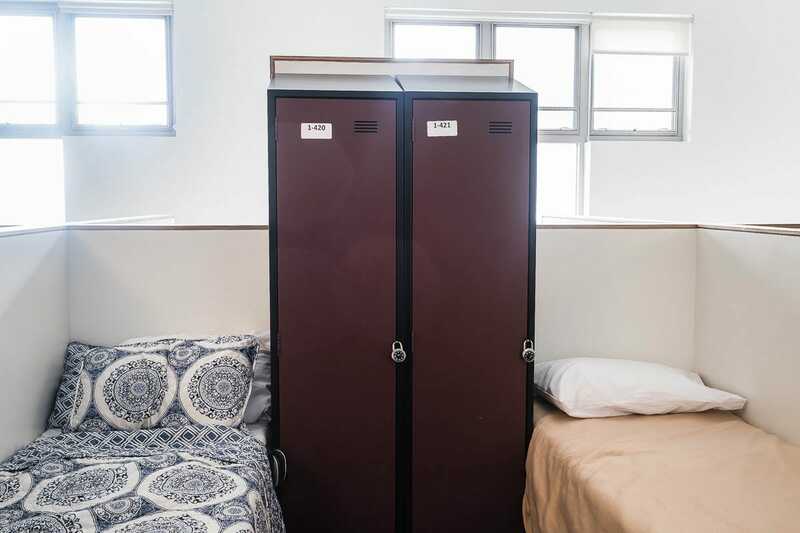 Linens, blankets, and toiletries are stocked in each client’s locker, which also comes with a lock. “It’s like a mix between college and sleep-away camp,” joked Rosenblatt. Harrison Jacobs/Business InsiderA locker and beds in a dorm room of the Landing Road Residence. Harrison Jacobs/Business InsiderTwo clients hang out in the cafeteria of the Landing Road Residence. The city is working to create more modern, high-quality shelters like Landing Road in an effort to get more people off the street. But many homeless see the shelter system as a dangerous, restrictive place. DHS spokesman Isaac McGinn said that’s more perception than reality. Harrison Jacobs/Business InsiderClients get lunch in the cafeteria of the Landing Road Residence. 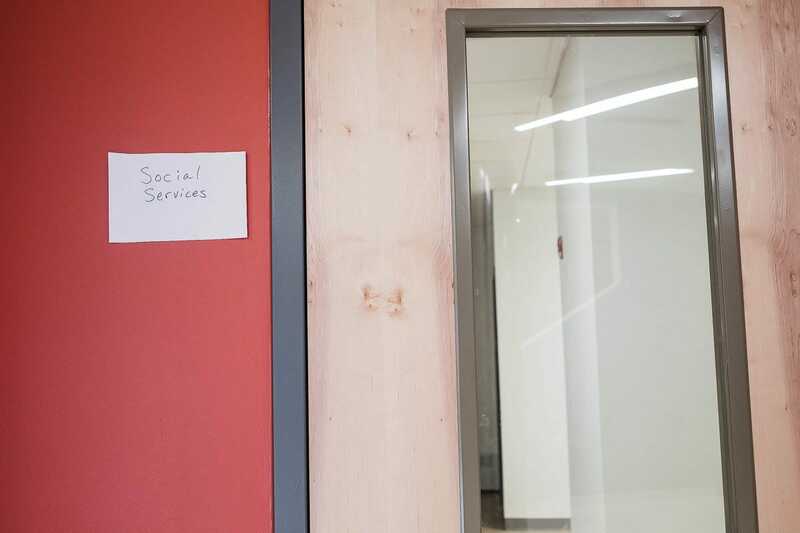 “If the last time you engaged with the shelter system was the ’90s, your impression of what it can offer you is very different,” he told Business Insider. For decades, the city has relied on so-called “cluster sites,” apartments rented out by the city at market rates or costly hotel rooms, to meet its demand for shelter. Those sites were often held in subpar buildings. The Turning the Tide program called for eliminating the 360 cluster sites, of which 42% have since been closed. Banks similarly suggested that Landing Road is the city’s “new approach” to shelters due to the facility being specifically built for housing the homeless, its non-profit ownership, and focus on a specific population. For example, free laundry is available on-site. 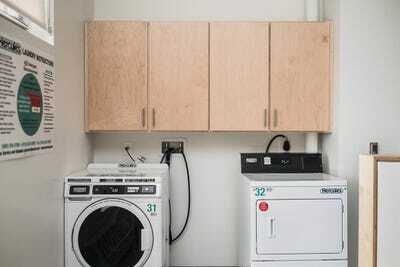 Harrison Jacobs/Business InsiderA washer and dryer in a dorm room at the Landing Road Residence. “It is a purpose-built location with not-for-profit ownership. 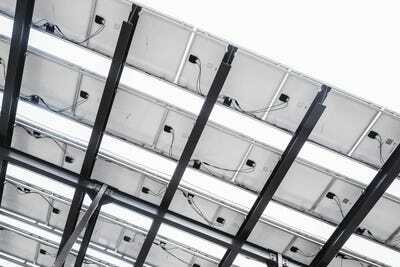 Those are qualities that we are encouraging our not-for-profit partners like BRC to pursue,” said Banks. 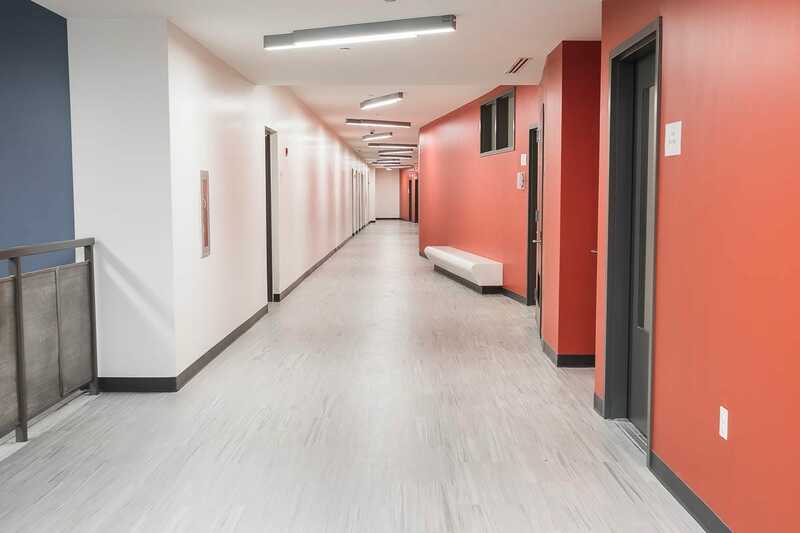 The administration is focusing on developing facilities like Landing Road designed to provide services to specific populations like those mental health issues, seniors, young people in the LGBTQI community, or families. 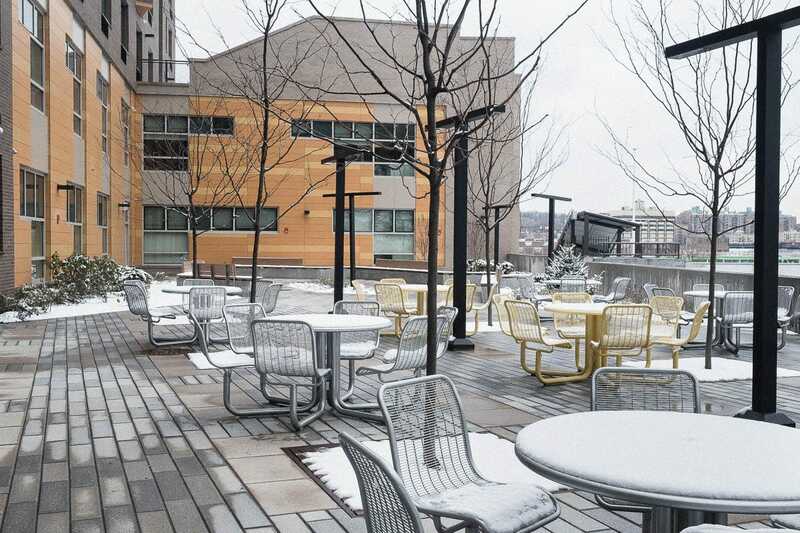 BRC added this patio area so that clients have a space to hang out outside without incurring questions from the community. Harrison Jacobs/Business InsiderA patio area at the Landing Road Residence. “People have a right to hangout, but we don’t want to make our clients’ lives any more difficult. 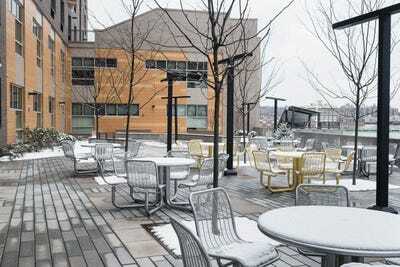 We thought why don’t we just give them a space to hang out outside,” Rosenblatt said. According to Rosenblatt, it’s something of a no-brainer for the city and other nonprofits to develop shelters like Landing Road. 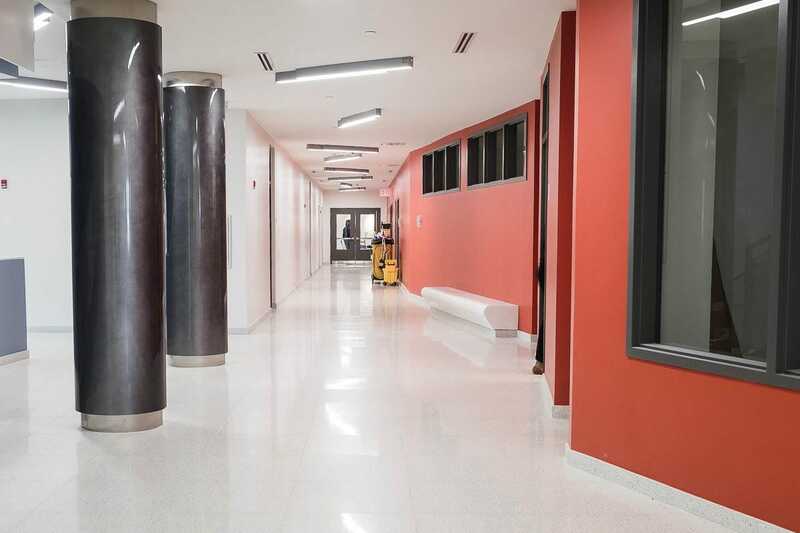 BRC is paying almost half-as-much per square foot as other shelters, according to Rosenblatt, and getting a brand new facility that also generates subsidies for housing. Harrison Jacobs/Business InsiderTwo staff members serve lunch in the cafeteria of the Landing Road Residence. 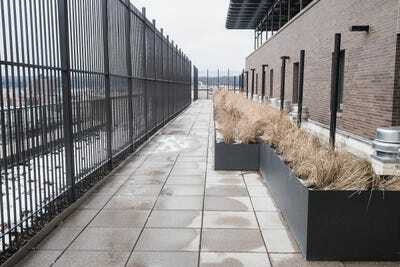 Apartments in the building are split between 111 studios and 24 one- and two-bedroom apartments. The studios, which will go to formerly homeless people, cost $US470 per month. The one- and two-bedrooms cost around $US714 and $US1000 respectively, and will go to community members by lottery. Harrison Jacobs/Business InsiderThe top floor of the apartment building section of the Landing Road Residence. While Padgett said she likes the idea of creating more affordable housing with the model, she worries that it will be hard for those living there to get away from the “institutional” nature of the building. Harrison Jacobs/Business InsiderA hallway in the Landing Road Residence. “When I hear these types of institutional solutions, it’s still living in a segregated, supervised program setting,” she said. The larger issue for Padgett is that developing and running a facility like Landing Road costs a lot more money than other solutions. Harrison Jacobs/Business InsiderA roof patio in the apartment section of the Landing Road Residence. “When I see all the money going into shelters, all I see is that money going into temporary solutions. When that same money could sustain a lot of families with rental subsidies and not have to live in a institutional environment,” she said. 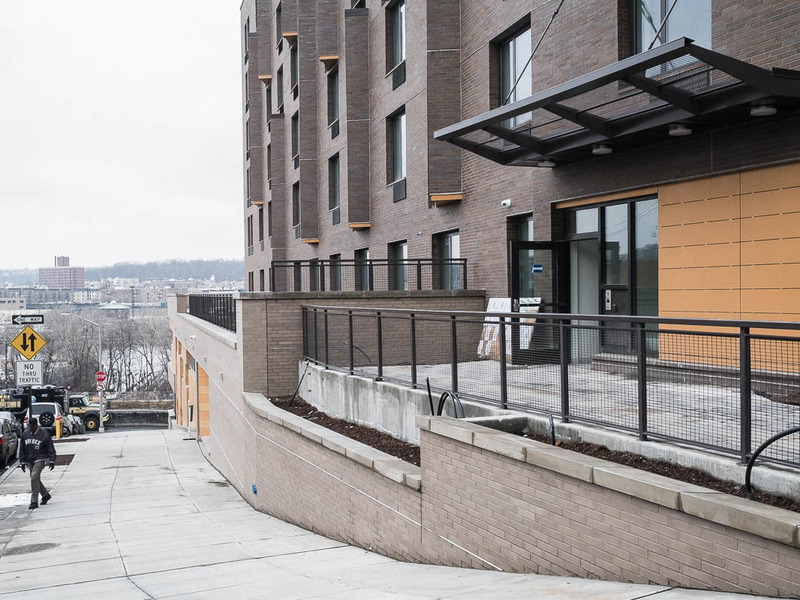 Still, for Rosenblatt, the Landing Road model represents an opportunity to show nonprofits that they can make a difference in the affordable housing crisis, and thus homelessness, simply by changing how they operate. Harrison Jacobs/Business InsiderSolar panels on the roof of the Landing Road Residence provide about 25% of the electricity for the apartments.